Chinese tech giant Tencent has amassed a $2 billion stake in Snap. The parent company of Snapchat said in a regulatory filing on Wednesday that Tencent (TCEHY) and its affiliates have purchased over 145 million of its shares. That works out to a stake of just over 10%. Snap said in its filing that Tencent, which developed the hugely popular messaging platform WeChat, had informed the American firm that it "looks forward to sharing ideas." Tencent is one of China's biggest tech success stories. China Literature, an e-book company in which Tencent owns a majority stake, soared as much as 100% in its Hong Kong IPO on Wednesday. 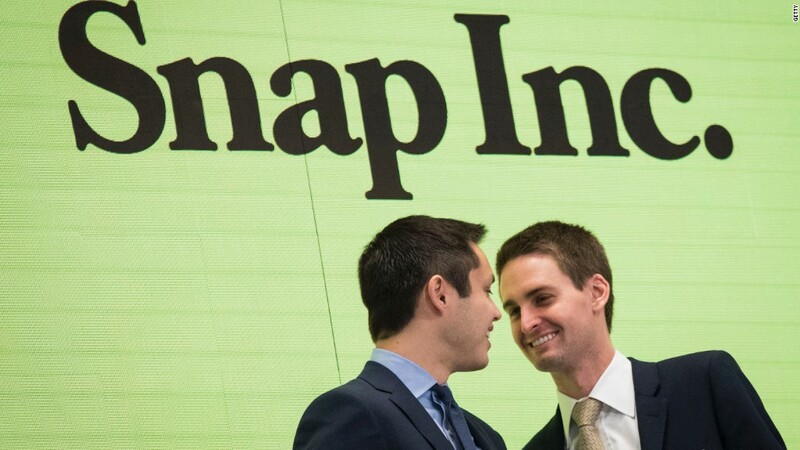 Snap, meanwhile, has struggled mightily since it went public eight months ago. The latest blow came Tuesday, when the startup said it was planning to redesign its app after several consecutive quarters of anemic user growth. Shap shares opened 10% lower on Wednesday. They are now trading almost 50% below their peak from March. The startup, which bills itself as a camera company, is not the first western tech firm to attract investment from Tencent. In March, the Chinese company bought a 5% stake in Tesla for $1.8 billion. In 2016, Tencent acquired Finnish company Supercell, the maker of popular mobile games Clash of Clans and Clash Royale.